OA’s keystone book has been updated and improved twenty eight year after it’s 1st publication. Revised for clarity and inclusivity with a restructured Step 4 chapter. Read how, through working the Twelve Steps and studying the Twelve Traditions, members have found physical, emotional and spiritual recovery. 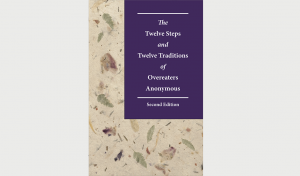 This comprehensive work provides a detailed account of how OA’s Steps & Traditions help members recover and how the Fellowship functions as a whole. Copyright 2018. Softcover, 180 Pages, Indexed.